The term life-changing is sparingly used when describing something incredible that has made a real difference to somebody’s life. In the case of one Northumberland man it’s the perfect way of referring to his corrective back surgery. Phil Crulley was left in excruciating pain when the reoccurrence of an old back problem (posterior excision of disc – aka a slipped disc) rendered him incapacitated and bedbound meaning he couldn’t stand up, walk, work, drive or lead an active life. The pain was predominantly in his back and leg. The reality being he was totally dependent on his wife and two children who became his full-time carers. 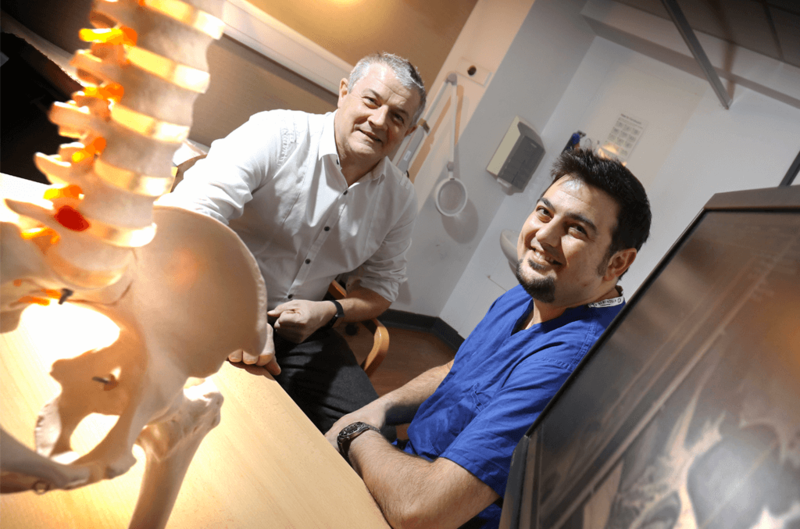 All of the worry and agony was to be forgotten forever when Phil Crulley met Orthopaedic Spinal Consultant, Cyrus Jensen, at Nuffield Health Newcastle Hospital. The resulting operation transformed Phil from being crippled with pain to walking 90 miles along Hadrian’s Wall…all in the space of 10 months. Phil Crulley, aged 53, was born and brought up in Newcastle’s West End but he later moved to Cramlington where he has lived ever since. Phil is married to wife Diane and they have two daughters; Amy aged 24, and Abigail aged 16. Phil has worked for a fabrication company on Gateshead’s Team Valley for the past 25 years. His current role is Sales Director. “A simple cough during a bout of Bronchitis was the bolt out of the blue that caused my prolapsed disc and saw my world come to a shuddering halt,” said Phil. Before this moment he’d enjoyed sixteen relatively pain-free years after initial surgery to repair his original slipped disc. Two months elapsed after the coughing incident, when Phil tried to deal with the injury by means of visits to the chiropractor and using mild pain-killers. It was a very bad reaction to the medication that caused him to experience a significant fall at home, resulting in him being rushed to hospital by ambulance when everyone else in the country was partying and singing ‘Auld Lang Syne’ as it happened on New Year’s Eve (counting down towards 2018). The best thing to come out of Phil’s trip to A&E and subsequent hospital stay for pain management, was the destined meeting with surgeon Cyrus Jensen, who just happened to be the on-call consultant that evening. After all of the tests and examinations Mr Jensen realised the state of Phil’s plight and the extreme pain he was suffering. Even a steroid injection around the affected nerve wasn’t enough to reduce the pain. But he [Mr Jensen] promised the patient that he would try his best to find the specific cause of his symptoms and formulate a management plan to treat it. Phil was then referred to Mr Jensen’s clinic at Nuffield Health Newcastle Hospital to start the journey back to recovery. The period immediately after Phil’s hospital admission, saw him not being able to walk at all. The only way he could get around was on all fours or tentatively on crutches. “The prolapse caused sciatica and a horrendous amount of muscle spasms that each time made me hit the ceiling in agony. It really hit home how much of our day-to-day life we all take for granted. Even the slightest movement was like torture,” said Phil. Mr Crulley was fortunate to have a caring family and friends who could provide a loving level of support. After evaluating the options, a joint decision was made to operate by trimming the back bone for a second time. Cyrus Jensen is a fellowship trained spinal surgeon whose practice is tending to adult degenerative needs – mainly the wear and tear of back and neck disease. He trained in Newcastle and has been operating in the region ever since qualifying as a surgeon. Cyrus has been a consultant at Nuffield Health Newcastle Hospital for the past 18 months. Mr Jensen said: “I just love being a surgeon and the challenges it brings; who wouldn’t love it? It’s fantastic. It warms you to meet the patients after their treatment and to know that what you’ve done is meaningful and has made a big difference to their life like in the case of Mr Crulley. Since the operation Phil Crulley has been on several city break holidays, returned to work and has even walked 50 miles along the Northumbrian Coastline and 90 miles along Hadrian’s Wall – achievements he never dreamt possible only a few months ago. Nuffield Health is one of the leading not-for-profit UK healthcare organisations, operating 31 hospitals, 111 fitness and wellbeing clubs, medical clinics and diagnostic units across the UK. Cyrus Jensen Nuffield Health Newcastle Hospital Orthopaedic Spinal consultant and prolapsed disc patient Mr Phil Crulley.